Home > Agile and Lean, Facilitation	> What makes a great trainer? A great training finds the core message, presents it with clarity and explains the message through several layers for understanding. My model has three layers and all of them are needed in order to deliver a great training. The topmost layer is artifacts: rituals, tools, templates, processes and anything else that you can observe at workplace. Many trainings limit themselves to this layer: goal of the training is to learn a new tool or process. The next layer is stories: it is examples, anecdotes, metaphors and other stories that are used to illustrate the topic. I also include games and simulations in this layer. Stories are a powerful tool to get the message through. Trainer sharing own experience or participants playing a simulation game is a good way to highlight key points of the topic at hand. The core – and my insight – is that a great training delivers a core message, key points that make the difference. A good training may fill you with new tools and great sories but a great training connects all this into a meaningful core message. 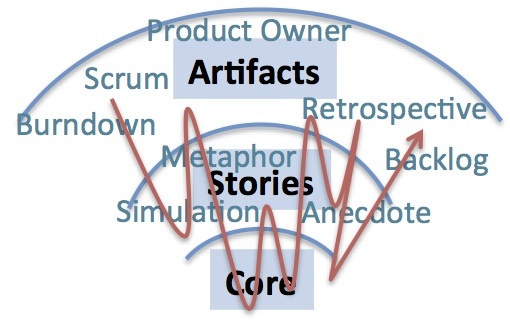 As an example, Scrum trainings at Reaktor cover the layers in the following way. 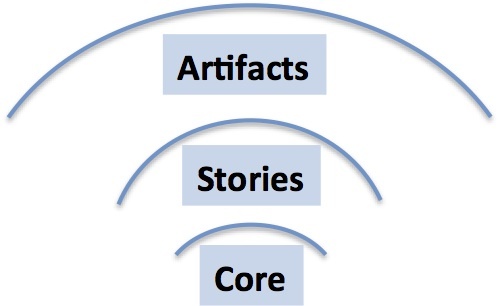 Artifact layer is about Product Backlog, Scrum process overview, techniques for scaling Scrum. Anything that you could use as is in your organization after the training. Stories are trainers’ experiences using Scrum and simulations & games we run during the training. The core message in the training is clear. It answers the question What for is Scrum? All artifacts and stories link to the core message and core message becomes alive through artefacts and stories. The core message must be relevant, focused and sufficiently unique to the topic at hand. An example of a bad core message would be: Scrum is about better quality and happier customers. Well, Scrum is also about that, but so is any other method. Such core message lacks uniqueness and focus. None of the layers alone are enough to provide a great training. Not even the core message is enough alone: The core message is not comprehensible without related stories and artifacts. OK, so far I have been talking about a great training. How about a great trainer? To my opinion the most useful skill for a trainer is not creating a structure for a training session or how trainer is using her voice or how to make beautiful drawings on the flip chart. Those skills are needed, but those alone do not make the trainer great. A great trainer finds the core message in the training he/she delivers. A great trainer understands the the topic – preferably through own experience – so thoroughly that the core message is relevant, focused and unique. Unique and relevant core message creates curiosity and curiosity leads to exploration. 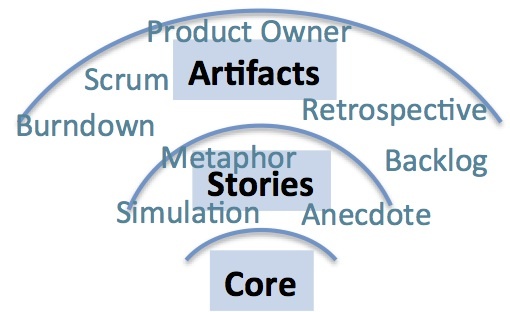 A great trainer balances between artifacts, stories and core message. Metaphors and stories make the core message more alive and artifacts show how the core message realizes in daily work. On my way to become a better trainer and qualified CST, I use this framework in all trainings I deliver. As a training participant, I listen the training content through this framework, Most recently, I used this framework to understand conference presentations in Lean Kanban CE. Paying attention to content and layers hopefully helps me become a great trainer.